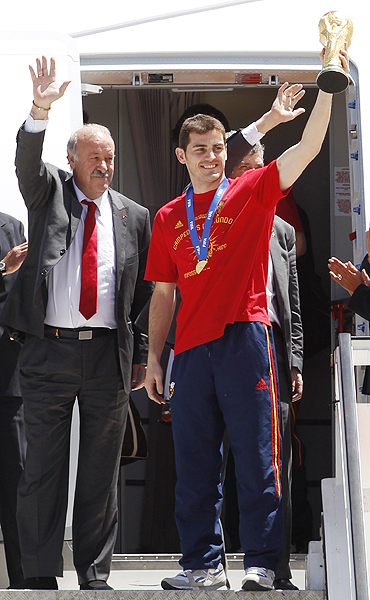 Spain captain Iker Casillas was first out of the aeroplane and held the World Cup aloft at the top of the steps as the team arrived back in Madrid for the start of the official celebrations Monday. The plane landed at Madrid's Barajas airport at about 3 p.m. (BST) where they were greeted by hundreds of airport workers who were waving flags and chanting "Champions" in temperatures that were touching 40 degrees Celsuis. 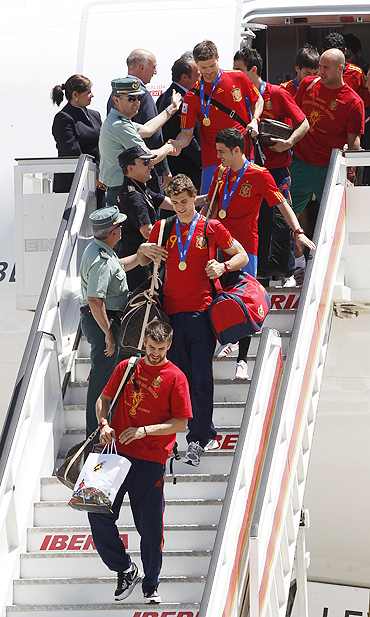 The squad quickly boarded a bus on the apron and were taken to a hotel in the city centre to change in preparation for an audience with King Juan Carlos, who had been unable to attend the final in Johannesburg on doctors' orders after an illness. Andres Iniesta took his penchant for scoring dramatic goals to new heights on Sunday when the midfielder smashed home the winner deep into extra time to give Spain their first World Cup triumph. The shy, pale lad from Fuentealbilla near Albacete stirred memories of his stunning Champions League effort at Chelsea in the 2008/09 season when he controlled a Cesc Fabregas pass and drove the ball past Netherlands keeper Maarten Stekelenburg. "It's unbelievable, incredible," an emotional Iniesta said moments before Spain captain Iker Casillas hoisted the gilded trophy. "It took a lot of energy. To win a World Cup is an indescribable feeling," added the midfielder. Spain's 1-0 extra time victory over Netherlands in the World Cup final left them with a probably unwanted record of the fewest goals ever scored by the winners of the tournament. Spain scored just eight goals in their seven games in South Africa, three less than the previous record low of 11 -- shared by Italy in 1938 (four games), England in 1966 (six games) and Brazil in 1994 (seven games). Spain lost their opening Group H game to Switzerland 1-0, beat Honduras 2-0 and Chile 2-1 in their other group games, and then achieved 1-0 victories in the knockout rounds against Portugal, Paraguay, Germany and Netherlands.